The holidays can be a joyous, happy, and stress-inducing time. For many, spending time with loved ones can be a bit conflicting. You're glad you're spending time with your family but the inability to find alone time and your one family member who holds polar opposite viewpoints than you and shoves them in your face, makes you want to bash your head against a wall. So how does one spend the holidays with loved ones and not end up institutionalised from losing their mind? I've come up with a few tricks to make your holiday season a pleasant one. No matter what your family tries to tell you if you feel run down, upset, or sad, you have every right to feel that. Allow yourself the opportunity to acknowledge your feelings. If you try to repress them, you'll only feel worse. Let those around you know if you need some space or a person to talk to. It is vital that your family listen to your request and respect the way you're feeling. If history has taught us anything, it's doomed to repeat itself if you do not make the necessary changes. Your loved ones may be respecting your feelings but don't expect miracles to happen overnight. If you know, Auntie So-And-So always grinds your gears, make sure you allow yourself some distance. You may not be able to change the opinions and actions of those around you, but you can change how you interact with them. If you have to be in the same room as these people, work on some mindfulness exercises to help calm you. Limit the amount of time you spend with these people. And know when it's time to walk away or what conversations not to engage in. I love my brother, but we do not see eye to eye politically. We've implemented a No Politics rule so that we don't end up hating each other. It's helped spare a lot of arguments and made time spent together much more enjoyable. These could include breathing exercises, progressive muscle relaxation, working out, or time to read. Planning in time for some self-care will help make the holidays a bit more pleasant. Just like in your day-to-day life, self-care is an essential part of holiday survival. As the holidays can be extra stressful, plan more self-care time than you would the rest of the year. For some, this may be a whole day where you're focusing on yourself. For others, an hour a day is enough. Make sure this time is uninterrupted so you can have proper time to relax. The saying goes to forgive and forget. I'm actually not a huge fan of this saying. You should forgive but don't forget. Accept. Forgetting often leads to one repressing feelings and can lead to more conflict. Instead, forgive and accept. Accept that the past happened, and implement strategies to ensure it doesn't happen again. This could be avoiding specific topics, don't push each other's buttons, and learn when it's time to take a break. Sometimes all the coping strategies in the world won't help the stress you're experiencing. When this happens, it's crucial when to know when to walk away. It's better to take a break and remove yourself from stressful situations rather than stay put and permanently damage relationships. Go for a run, see a movie, or take a run to the shops to clear your mind. This way you're able to reapproach the situation with a clear head upon your return. The holidays don't have to be a stress-inducing time. One just has to arm themselves with ways to decrease stress whenever possible. What strategies do you use to help cope with holiday stressors? Share them in the comments below! I'm feeling the holiday stress right now! We are hosting and it seems like our friends and family are very different from each other so trying to create the dinner menu is proving more complicated than I thought! Will have to try these tips on stress! Thanks! Oh no! I hope the holidays didn't end up being too stressful and these tips helped! I love your point about how your feelings are valid. I think people sometimes forget this. <3 you have every right to feel how you'd like. Exactly! It always frustrates me when people try to tell someone how they should be feeling or that what they're feeling is invalid. So uncool. This is so helpful. 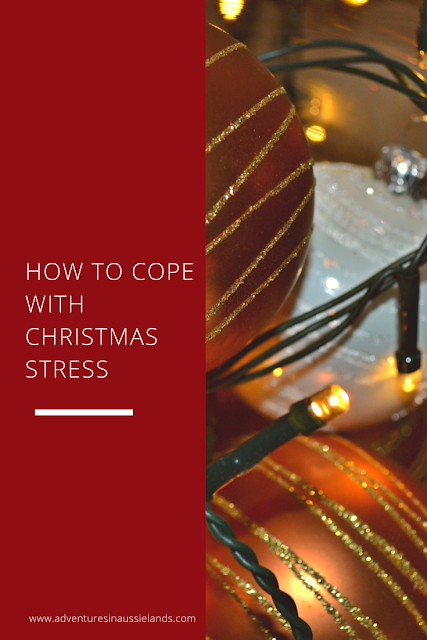 We all can get caught up in the stress of the holidays. I try my best to know when to walk away. I also try to take time out of the day to just zone out and stop thinking. It is really important if I want to keep my sanity! These are such great tips! I'm starting to feel the stress!